You know how it is when you “know” something is true, but you’ve never examined it closely or had it tested on Mythbusters, and then you do, and the results aren’t quite what you expected? When Mennonites get together, they tend to migrate into gender-specific groups. Often it’s men in the living room, ladies in the kitchen. So the ladies talk among themselves, and the men talk among themselves. Usually, I can hear what the men are talking about and my impression was that their conversation is just so much more interesting. I’ve had plenty of times when I wished it was ok to leave the ladies and join the men, but usually it would be odd at best and impolite at worst. Such as that one time the ladies’ conversation was lagging and fluffy, and I could hear one of the guys expounding on this book he had just read about World War II and the Holocaust, and it was terribly fascinating, and I wanted soooo bad to be in on that conversation. This is where some of you are thinking that this ought to read like a good Amish novel, where the smart and sassy heroine is stuck in this patriarchal culture, poor oppressed her, but she is so plucky and courageous that she finds the passion to break all the conventions and go flounce onto the couch with the guys and join the conversation and let the fluffy little birds in the kitchen gossip in shocked whispers about her. To you I say: Please move along. You don’t get it. I decided to do some informal research. Paul’s nephew Justin and his friend Jon did a series of vlogs last February on a trip they took to Europe. Last week they were both in Oregon so they posted a new one in which they compared Plexus’s Pink Drink, coffee, and kombucha. I’ll link it if I can figure out how. I took the time to watch it, for research purposes. It was interesting, in its way, but maybe didn’t make the best case for guys’ talks being erudite and stimulating. They used more words than I deemed necessary. “Wait wait! If we drink this, how will we know if Plexus was efficacious?” says Justin at one point. Paul’s brother Steve and his wife, Bonnie, had a few out-of-state children at home last week, so they invited a whole raft of relatives over for dinner. We ate outside, and when I got my dessert and returned to my picnic table, it was full of guys. So I sat down and took notes on a napkin. “Is it true that someone offered 43 cents recently?” said Paul to Phil. I think he was talking about fescue seed. “I bet the straw people are gonna buy them all up!” said another. “Naaahhh,” said a few more. I went inside and joined the ladies’ conversation in the living room. Bonnie and Stephie were talking about how the nieces and nephews love Chris, Stephie’s husband. Then Byran’s wife, Amy, and Bonnie’s sister Nancy talked about nursing exams, and passing state boards, and how the tests are set up on computers, and when the test questions stop coming, you don’t know if you’ve done really well or really bad. Frankly, I liked the ladies’ conversation better. Men tend to talk in facts and data, numbers and forceful opinions. Women tend to talk about people, experiences, relationships, dilemmas, and feelings. Sometimes you get a happy combination of men and women who can toss the conversational ball in a lively mix of ideas, history, good questions, helpful conclusions, and personal stories, all with that indefinable essence of wanting to affirm one another and hear and learn from each other. Those conversations are a rare gift. But chatty conversations about everyday life are good gifts as well. What I’ve concluded is that maybe it’s not so much men vs. women as it is my group vs. theirs and the grass on this side of the fence vs. the other. You know how some of us have a gift for always getting stuck across from people who sit in silence and let the conversational ball clunk down like a flat basketball, over and over, and down the table, close enough to overhear but too far to participate in, everyone is friendly and talkative and smart and engaged, and the words get tossed back and forth as rapidly as the tennis ball in a Wimbledon match, and there are bursts of wild laughter? Ooooo it is just painful. The key to an interesting conversation, in my opinion, is to make sure that the ball gets tossed around, people all around contribute, and everyone has a chance to speak. That’s more important than the actual topic. Silence isn’t good, but neither is dominating the conversation. Balance is key. I discovered a long time ago that Paul and I differ on our opinion of people who talk too much. I don't mind one person talking more than others as long as everyone gets a chance to talk if they want it, here and there, which is much better than cold and awkward silence. And sometimes I don't feel like talking, so I ask a leading question to unplug the dam, then I sit back and listen and enjoy. But it bothers me when someone takes charge and never gives others a chance to talk, such as the guest we had one time from back East who talked nonstop through the whole dinner. I expressed this, later, and Paul said, “But she was interesting to listen to.” He felt that this made her behavior at least tolerable, maybe even justifiable. But that brings us back to the elusive “interesting,” which is a very subjective thing. And we think: helloooo, we all believe in Creation, no thanks to you. Although I admit that *somebody* in this house has a tiny tendency to argue with people who aren’t present, now and then. Me: Marcus said that some animal-rights people snuck into a mink farm by Eden Valley and released 38,000 mink last week. And thousands and thousands have died already, from thirst and stuff. They have no idea how to live in the wild. It’s really awful. Him: THOSE ANIMAL-RIGHTS PEOPLE ARE ALL ABOUT TREATING ANIMALS RIGHT AND WHAT THEY DON’T REALIZE IS THAT THEY’RE BEING WAY MORE UNKIND LETTING THEM LOOSE THAN LETTING THEM STAY ON THE FARM! Me: Um. I know this. I agree with you. 3. The single raging obsession expounder. We had a guest one time who was sure that there were stray electrical currents coursing through farms and cow barns in the Midwest. There was some sort of conspiracy behind this, he just knew, and the solution was complicated and vaguely spiritual but also involved the government, maybe? I think this guy was also making money off the solution, which raised some question marks in our minds, in addition to the ones already there. He talked about this and only this all afternoon. Paul talked louder than necessary about the actual science of electricity and conductors and such. It was one time when I was happy to duck out of the men’s conversation. So. I’m not really reaching any far-reaching conclusions of any sort, only that we should all practice the art of tossing the conversational ball back and forth. This includes me, because I can rattle on when I'm with a good listener. I am very fortunate to live in a world of people who have good stories to share and really, there are plenty of times when the wild laughter is at our end of the table and not at yours. "Harold": I was sixteen and a half. And one Sunday morning my dad said, 'You take the pickup on to church. I'm takin' Mom to the hospital." So I did. I didn't know why Mom had to go to the hospital. And that boy there [indicating his brother across the room] was born that day. I had no idea! You'd think it would be easy. I love to sit down with people and listen, talk, tell stories, hear stories, affirm and be affirmed. We don't have to DO anything. Table games are not my cup of tea. Shopping and going to concerts and quilting together are ok at times, but I love just being together and catching up with their lives. Even more, I love to have friends who speak into my life. I like to be friends with wise women who think about who they are and why they do what they do, who flex with change, who try new things, and who listen to what God is teaching them. And it is so hard to make it happen. A few young relations have been analyzing friendship the last while, such as Emily a.k.a Otter over at The Girl In the Red Rubber Boots, and Shelley at Frame of Mind. Why don't you go read their posts while I go make a pot of tea, then come back and we'll sip tea and talk about this vast and important subject? I grew up in kind of a friend desert. At our little church in Minnesota, there weren't any girls my age until I was about 14. I had one best friend through high school, a Catholic girl named Carrie. When I went to teach in Oregon, I went a bit crazy, socially. One December, between going out to eat with friends, Christmas caroling with the youth group, the school Christmas program, and I forget what else, I had something going on every single evening of that month. As a young mom in mission work in Canada, I formed deep friendships with other women, such as my cousin Kay Knepp, who lived on the other side of a duplex one year and then, a few years later, on the same lane. We walked together in the mornings and talked about things. It was wonderful. But here in Oregon, the last number of years, it's been hard. All the urgent things keep yelling at me, so many people need me, and it is just. so. hard. to deliberately make time for friends. No one lives close enough that we can chat over the back fence. I am not good at planning. I am always overwhelmed. I still have a full nest and a lot of responsibilities. As Paul's sister Lois told me--not a direct quote but this idea--"You and I are the same age but in very different stages. I have so few demands on me that I could very easily become self-indulgent. I pack Eric's lunch in the morning and a few things like that, but mostly I CAN DO WHATEVER I WANT. I could take off and go to the coast tomorrow if I wanted." I said, "Wow. I am not there." She said, "No, you're not." So I go galloping on, trying to take care of everybody and the chickens and cats and potted plants, until suddenly I just feel lonely. And I think, I haven't had a good conversation for a LONG TIME. Or, I should say, a good conversation with a local woman-friend, the kind that takes deliberate decisions and planning ahead. More than a single Best Friend, I've found I need a variety of friends. This one to discuss writing, that one with a similar spiritual gift, another to make me laugh, still another to help me through mothering dilemmas, yet another to feed my creative side. Paul and whatever children are home like to talk and are good at listening, so some of those needs are met there. My sisters and I message a lot and talk now and then. My sisters-in-law and I have a coffee date once a month which is just balm and nourishment to my soul. I sporadically have coffee with a few others. Maybe the key to real ongoing friendship is a regular date that is sacred, traditional, and cast in concrete, so to speak. Today, I am happy to report, I invested in friendship, and it was worth every bit of frantic preparation. Paul's sister Lois's birthday is four days before mine. My neighbor Anita's is the same day as Lois's. Anita is 11 years older than Lois and me. We have met for a birthday tea for....has it been ten years? Or more? You can't expect us to know this, because we had a round-and-round conversation trying to remember who hosted us last year and whose turn it was this year. None of us had any memory of when we last hosted, but we concluded it wasn't me, so I was happy to do it, plus the porch was relatively clean and I wanted to try a new chicken salad recipe. I had a yellow themed decor. The sandwiches were delicious if I say so myself. It wasn't too hot or too cold. The cake was just chocolatey enough. But the very very best part was the conversation with two wise and funny women who know me and my family and a good part of my history, who give me perspective, who are patient when I chatter too much, who accept others and don't try to press any of us into any sort of mold, who make me laugh, and who leave me better and wiser than before. What did we talk about? Grown children and the multitudes of angles on that subject. Being 50 and realizing you don't care what people think, and how liberating that is. Our parents. Who to go to for the best machine quilting. Books and authors. "We need to do this more than once a year," I always think. And then we don't. But I do make sure it happens once a year, because it is tradition, and we all plan for it, and it is important to us. Finding ways to make this happen more, with various friends, is surely as important a resolution as walking more and organizing my paper piles. I'll be like Shelley and Emily, and ask you to speak into my life on this subject. How do you pursue friendship when you're a busy pastor's wife and mom, especially when so many people need you, but not as many can replenish what you pour out? How do you choose friendship, which is fun and rewarding but feels self-indulgent, over taking care of the sick and lonely and afflicted? How do friendships change over time? How do you make friends with people in different stages and walks of life? How many friends are enough? I'll sip tea and listen. One of our traditions is that Lois brings a sack of hand-picked second-hand books. She has introduced both Anita and me to new authors that we have come to love. and we still weren't talked out, but we needed to make supper. "Anything else you want to tell me about your party? I thought about sitting close and eavesdropping." --Paul, this evening. He was inside doing warehouse paperwork while we had tea. I don't know why it makes me so happy to know that he was curious about our conversation. Maybe because men so often have more interesting conversations than women, which is a rant for yet another day. This is not like it used to be,” I thought as my three energetic daughters­ strode ahead of me down the wide trail at Shore Acres, fast and graceful,­ with their long skirts swinging, fairy-like, in the dappled sunlight. Puffing along behind them and too out of breath to talk, I had time to think rambling and sentimental­ musings about being a mom, time passing, kids growing up, how did this happen and how blindingly fortunate I am. And how walking with my kids is no longer what it once was. My husband began teaching at a Native American reservation in Canada when Emily was a baby, Amy was 2 years old, and Matthew was 4. In a village of gravel roads and few amenities, we walked everywhere. It was always slow going, with the local grandmas stopping us to pinch the kids’ cheeks and exclaim to each other in Oji-Cree, Matt asking a million questions, and Amy hunting for pretty rocks. With her brown eyes wide with awe, Amy would pick up every unusual stone, turn it over in her hand, admire it as though it were turquoise or amethyst instead of a piece of gravel, show it to me for additional affirmation, and carefully stow it in her pocket. Going to the post office or the store was a painfully long ordeal, and we always came home with a precious collection of rocks in the pockets of Amy’s lavender jacket. When Paul was home, I would leave the children and go on walks alone, marching as fast as I liked. Amy is all grown up now and has taught English in Thailand for more than three years. She rides her motorbike all over the city and chats with her favorite food vendors in fluent Thai. She is efficient and energetic, a world traveler and a great cook. Intrigued with the southern Oregon Coast, we used my careful savings to reserve a small house near Port Orford. Amy offered to be in charge of the food. I packed lots of books and crafts and paperwork. Emily brought hiking poles. Jenny, the youngest, kept us entertained. The house was old and small, with a quirky charm in its slanting floors. Jenny was dubious about the sliding barn door on the tacked-on bathroom and its resulting lack of privacy, and solved this problem by playing music loudly on her phone, as needed. The girls soon discovered that the beach was close by, just across a small meadow and the nearest dune. For four days we relaxed on the sand, shopped at thrift stores and ate Amy’s extravagant rice concoctions or burrito bowls, heavy or light on the cilantro as our tastes dictated. We talked and laughed and discussed: college, romance, books, memories, future decisions. We cured Jenny’s hiccups, sat around a driftwood fire and read books on the beach, leaning against a large log. We pored over maps, read historical markers and took a tour of a lighthouse. Very little crafting got done, and no paperwork. Often, we walked: up the hill and down the road to Paradise Point, out to the Heads and Battle Rock near Port Orford, north to Coos Bay and the clifftop trail to Shore Acres, and, one sunset, down the long grassy path to the beach at Cape Blanco. The girls would wait for me when the path intersected with another, then turn and continue their rapid pace as soon as I appeared. “Let’s go where it’s dangerous,” Jenny would say, staying on the trails but choosing the narrowest path above the highest cliffs, then posing for pictures, hand on hip, outlined against the sky. I was the one who stopped and admired the scenery, stroked shiny leaves and delayed the others while I gave a lesson in identifying sword ferns. Mostly, I absorbed the wonder that my children not only survived to adulthood under my care, but remained people that I like to be around. The day that seemed impossibly far off, back when we walked those dusty northern roads, has arrived. All of our six children are adults, ranging from 18 to 31 years old. I don’t know how it happened. Oddly, every one of them was, or will be, in college in 2017. One just graduated from Oregon State, two are going for advanced degrees, one will be a freshman, and two are sophomores. So far, none are married. Surely I was the least-confident young mom ever, and our children had the widest possible range of personalities and needs. Of course, we had many good times, but we also had lots of tears and tension and noise, of poverty and worry and having absolutely no clue what was the right thing to do in this moment with this situation, problem, behavior or conflict. Yet, to my astonishment, they turned into wonderful grown-ups who make good choices, care about others, laugh easily and fearlessly take on the world. They all pay for their own education, and are debt-free. Blessedly, they like to spend time with their dad and me. I can easily list the things we did wrong, but how do you isolate and quantify what went right? Even more difficult: How do you figure out what someone else ought to do? Ours are all adventurous yet purposeful, so this system worked for us, but I’m sure it’s not for everyone. I’ve found that parenting is also a balance between discovering who your child is and shaping them into who you want them to be. We always felt they should be others-oriented rather than thinking only of themselves, but we also knew they would be most effective if they followed their God-given interests and gifts. That was why I made our children be polite to the curious grandmas in that little northern village, and why I slowed our walks to unbearably dragging paces while Matt and Amy asked questions and picked up dusty little stones. Even as I try to answer their questions, encourage them and be helpful, the truth is obvious: What do any of us really know about this beautiful and terrifying work of raising a human being to adulthood? There are no guarantees or easy answers, only love, hard work and the grace of God. If you learn and sacrifice and give your best, sometimes a surprising day comes when you walk down a sunny coastal trail with your charming daughters who want you along, the world is swinging with amazement, and your eyes fill up with an overwhelming gratitude. The house we stayed at. The ocean is just over that dune beyond the lane. My brother Fred once defined poverty and wealth as being on the moving walkway at the airport. Wealth is when you move with the walkway. Even if you sit on your suitcase and rest for a bit, you're still moving forward. Poverty is when you're moving against the walkway. If you work really hard, you can stay in the same spot. If you rest for just a bit, you move backwards. It's awfully hard to catch up and almost impossible to make meaningful progress. The analogy works with writing as well. When you're a beginner, it seems the system is against you. Editors have never heard of you. You don't have connections in the industry. Readers are skeptical. At that stage, it takes an awful lot of work to make progress. You have to research markets, figure out writers' guidelines, contact editors, submit your work, and keep hoping. If you're a blogger, you have to keep writing, posting, and—if you want to increase your readership more quickly—commenting on others' blogs so they'll come visit yours. If you take time off, readership drops immediately. If you keep at it for the long haul, the magic day will come when you suddenly realize that you're going the right way on the moving walkway. The momentum is with you and not against you. You can take a break and pick up pretty much where you left off. Other people decide to promote your work, so you don't have to do it all yourself. And you can sit on your suitcase and just breathe for a bit. As I'm sure I've explained before, Good Books, which published my first three books, was bought by Skyhorse Publishing. 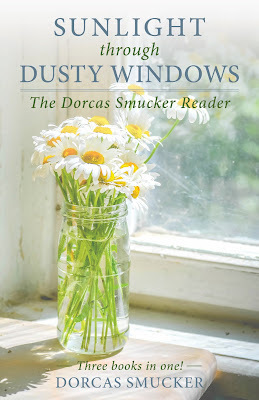 Recently, Skyhorse decided to publish my three books under one cover and a new title, Sunlight Through Dusty Windows, due out in September. Some weeks later, I received an email with all sorts of documents and information. This person is your editor, it said, and that one is your publicist. Fill out the publicity forms first, so we can give your book as much exposure as possible. And here's what you can expect throughout the process. I was a bit stunned. Good Books had never gone to this much trouble, and certainly with self-publishing I never had anyone invest that much effort on my behalf. It was like suddenly having cooks and servants rush in my door to set things in order and prepare a gourmet meal. There's only one teeny little problem with this process: the book will contain material I wrote ten, fifteen, even seventeen years ago. We all progress and improve as we keep writing, at least I hope we do, and most of us find it a weensy bit appalling embarrassing painful to not only re-read material we wrote back then, but to see it marketed to reviewers and readers and bookstores. I wrote it, it is what it is, and I'm eager to see what happens. In other news, I want to self-publish another book, to be out this fall sometime, and I have an editor/secretary right under my own roof. Emily just graduated from Oregon State University with a degree in speech communication and a minor in writing. She is eager to fill her resume with actual experience. I can't recall--was it her idea or mine to turn her loose on my next project--the sixth compilation of newspaper columns? "Sis mich fa-laet," the Pa. Dutch phrase says, "It's me dismayed(? )," implying not only dread but something deeper, a looming sense of something you must face but just so badly don't want to. Well, it was me fa-laet to compile that book, all the digging through documents and emails and the Register-Guard website to find the published columns, then clicking and copying to put them all in one document. For me, this always involves careful highlighting and then suddenly the cursor slips like a foot off the clutch, the highlights disappear, and I have to start all over again. After that comes the organizing into sensible themes, then the grim job of writing titles, and finally the unspeakable task of reading my own work, over and over and OVER, to make necessary changes in wordage and edit the stuff that offended too many people and add here and cut there and make sure it's all properly punctuationed and spelled. So I hired Emily. I felt sorry for her, but she seemed eager, and she is an adult after all. In less than an hour, people, specifically FORTY-SIX MINUTES, she had waded through all the old emails, documents, and web pages and put them all into one Word document. The next week, she came to me with a good idea of what order to put the chapters in, and how I can make it flow more like a chronological book than a random collection of essays. Also, she said, she noted the places where I had briefly told stories and she thought they should be fleshed out in greater detail, "Because your gift is telling stories." She didn't have a bouffant hairstyle, cat-eye glasses, and a pencil skirt like a 1950's secretary, but she had the same capable and efficient aura. I feel like not only am I relaxing on my suitcase on the moving walkway, but I've died and gone to writer heaven. 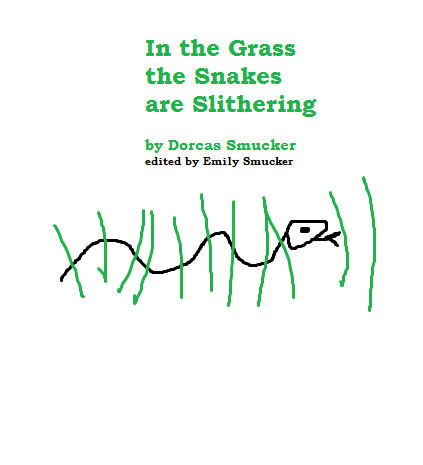 I have only one tiny little complaint about Emily's work: she came up with the working title for this book: In the Grass the Snakes are Slithering. Her work is such a relief to me, though, that I am not making a fuss about her title, and that is saying a lot. I'm sure she'll come up with a descriptive "real" title when it's time to get it printed. This is for all the folks who are sure that my family gazes at me in awe every morning because I'm a real Author. Me: It's Steven's turn for the dedication. Jenny: You have to keep going! I don't want to be the only kid with no book dedication! Ben: Is it that important? Jenny: How would you feel if you were the only kid without a book dedication?! Ben: I would only know if I actually read them. Really, they are all the most supportive family ever. Supportive, and also honest. But not at all wowed, which is as it ought to be. c) saying something like, "Dear Mother, We are safe and well. Please do not worry. We are in no danger of being surrounded by fire. And we have plenty to eat. Also the rest of the crew are all Christian guys from Liberty University." c) "Have you moved your stuff out of our room yet?" Honest, I'm just glad he's well enough to be thinking of such everyday things. And yes, Ben hauled the last of his things out the door this evening. He's moving into a house in Corvallis with three other guys. I have such mixed feelings about that empty nest idea. And yes, the empty nest is still a hypothetical idea. Until Ben left this evening, there were seven people living here. Amy is home for six weeks, my dad is here for a few months, Amy's friend Joy joins us for a few days before she and Amy fly back to Thailand, and a nephew is coming in August to work for us. And to live here for the duration. I love having a houseful of interesting people, but as an introvert I need some alone time every day, or at least a few times a week, to keep my mental faculties from exploding. That can be very hard to put into practice, hence the mixed emotions. Dad at age 100 likes to crack walnuts with the large levered nutcracker that my brother Marcus made. Walnut shells go flying into the neighboring pantries and clacking onto the floor right where bare feet are likely to step on them. But the job gets done. Dad can hardly hear, but visually he doesn't miss a thing. We were eating outside one evening when suddenly Dad observed, "Now we can see that Amy has been living in a foreign country, just the way she uses her spoon and fork." Indeed. She had been using them according to Thai manners, where the fork doesn't go in the mouth, and is only for pushing food onto a spoon. Jenny starts driving a combine this week. It's the first time for her, but she felt like she needed a summer of really experiencing harvest. A local farmer hired her. They say that girls aren't as hard on the equipment as guys are. A fox ate most of my chickens, one by one, which caused me great frustration and pain. Paul got a Havahart trap and I caught a very mad cat, twice. Emily graduated from college, but that is a story for a different day. Ben's car was at the shop. Ben: You can pray that I didn't blow a head gasket. Me: Ok. But do retroactive prayers work? Ben: Maybe it's like Schroedinger's cat, where it's both alive and dead until you open the box.